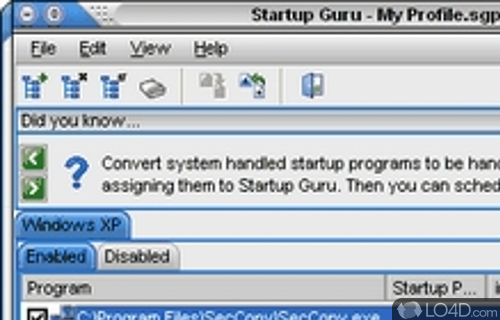 Startup Guru is a shareware autostart management app filed under windows boot software and made available by Lincoln Beach Software for Windows. The review for Startup Guru has not been completed yet, but it was tested by an editor here on a PC and a list of features has been compiled; see below. If you would like to submit a review of this software download, we welcome your input and encourage you to submit us something! Startup Guru will manage how your Windows computer starts up each time. You can add, remove or temporarily disable any item. Great for removing adware/spyware or anything else that is slowing down your ability to get started using your computer! Scheduling startup items is another handy feature. Many programs don't need to start right away, so you can set them to start at a specific time after bootup. See what Windows is starting up. Profiles allow you to manage bootup options. Schedule when programs should start. Speed up Windows startup and use your machine faster. Startup Guru is licensed as shareware for the Windows operating system from windows boot software and can be used as a free trial until the trial period ends (after 20 days). The Startup Guru 2.2 demo is available to all software users as a free download with potential restrictions and is not necessarily the download of the full version. Compatibility with this autostart management software may vary, but will generally run fine under Microsoft Windows 10, 8, 8.1, 7, Vista and XP on either a 32-bit or 64-bit setup. A separate x64 version may be available from Lincoln Beach Software. This download is distributed as startupguru.exe. We have tested Startup Guru 2.2 against malware with several different programs. We certify that this program is clean of viruses, malware and trojans.